I really enjoyed being at the first official European Maker Faire, in Rome earlier this month. I’ll do a proper blog post about that when they have the videos of the talks (including my one) online … which will hopefully be soon. Meanwhile, while there I met Zoe Romano, who asked to interview me for Che Futuro, an online magazine about innovation and creativity in Italy. We did the interview by email, and presumably it will appear there in Italian, so here it is – exclusively! – in English. 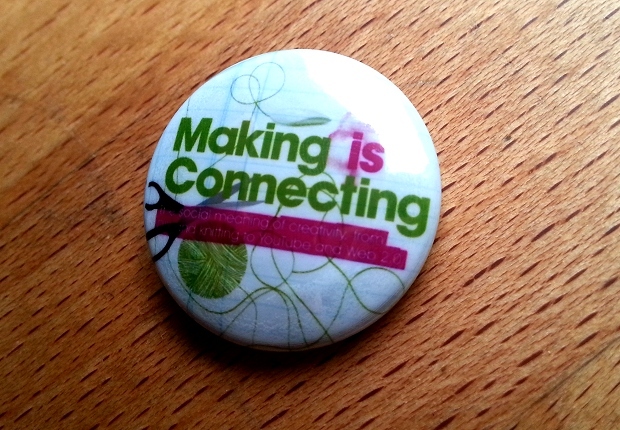 Zoe Romano: As you pointed out in your book ‘Making is Connecting’ (‘La società dei makers’), digital media, web 2.0 created an open and accessible infrastructure that people can use to make things, boostering self-expression, resiliance and participation. In some domains the consequences of this didn’t mean only having more people engaged in collaborative processes or getting more pleasure by sharing but it became also a real challenge to how certain industries were organized (for example music, video and even fashion journalism). Is DIY invading the realm of “professionals”? David Gauntlett: Oh yes, of course, this new, internet-supported DIY culture is incredibly disruptive of existing professions. I see that as a good thing. A key theme in the book is that in the twentieth century, we learned to be ‘audience’ of things made by professionals, and ‘consumers’ of things made by expert producers. That situation is interesting and rewarding for the small minority of professionals, and it might be convenient for the audiences and consumers, but it’s not necessarily a great thing for society. It’s too easy for people to adopt what I call a ‘sit-back-and-be-told culture’, when what we really need is a ‘making-and-doing culture’. People should participate in culture, and you only really participate in culture when you’re making things, sharing them with others, and having conversations around them. Being a consumer of culture is fine – at different times, we all pay attention to things made by others, and that can be interesting – but to drive society forward you need more emphasis on the creative side. What makes people happy in the long run usually depends on having control on a project, like when you do an activity from start to finish. Put your own ideas into practice, then become proud of it and share it with your friends. Yes that’s right. This has been explored by researchers, and the book pulls together that evidence, which shows – yes – that human happiness can really be improved by having control over a project, and being able to share it within a community of interested people. This process of creation is very rare in our day to day work (the job that pays our bills) where most of the time is taylorized even in the creative sector. But many people, working in it (like in fashion, media, design, etc), want to bring it this type of satisfaction into their profession. Do you think it’s utopian? There are usually quite easy things that can be done, by managers, so that workers have more control over whole projects – or, if necessary, at least whole parts of bigger projects. Most people respond really well to being given more responsibility, and being asked to play a more creative role. So that kind of shift can be good both for the individual workers, and the end product. Approaching market saturation, companies had to differentiate their products from competitors attaching an immaterial meaning to them and creating ‘experiences’ around their brand. It started like a marketing trend but more and more people don’t want to buy something; they prefer to buy into something. The result is that the crafter/maker DIY culture not only seems to provide people with more authentic values but often creates commons-oriented processes that involve people in a real process of activation and participation. Do you interpret this as some kind of anti-consumeristic path or something else? I think sometimes ‘anti-consumerism’ sounds like it is opposed to people having nice things in their lives. But everyone has things in their lives, and it’s better if they’re nicely made, pleasing, interesting things. The change you’re talking about is where people don’t just want to just be given ready-made things – especially if they’re not good quality – but even if they are well-made things, it’s still much more exciting and involving to be making things yourself. And then, those things become part of the culture you have around yourself, they help to express something of your identity, you can put your own mark in the world and show how you’re distinctive in some way. And on top of that, these cultural symbols you’ve made become part of the collective culture that you share with others, and which help to build meanings and conversations. It’s a happy combination of individualism, and collectivism, but people having a voice and not having to surrender their own voice because some professionals know how to communicate in a more polished way. Have you explored how far resilience and empowerment of communities could go with the use of rapid prototyping machines like 3D printers or laser-cutters, tools previously unavailable to the masses? There’s a lot of excitement about 3D printing at the moment. Personally I’m interested in all kinds of making, not just 3D printing, but obviously 3D printing is an exciting new thing right now. You see people printing all these kind of pointless objects, just because they can, and it seems a bit strange to me – I wasn’t previously feeling that my life lacked pointless plastic objects. But someone said something at the Maker Faire in New York, which I liked, which is that right now, it’s like the early days of the Web. People are excited, they’re mucking about, they’re doing all sorts of pointless things just because they can. And then, over time, it’ll mature, and people will work out the really good things to do. So once I’d heard that, I was much more forgiving about the pointless plastic objects. What will happen, for example, when users claim the right to repair worn out parts, while manufacturers will fight to control planned obsolescence upon which they insure their profit? Well, that’s a good example of where new technologies can help people push companies to improve the way they do business. Planned obsolescence isn’t a good thing; if customers can fix their own stuff, or force companies to make better and more sustainable products in the first place, that is obviously much better. Interdisciplinarity is where most of the innovation happens. For example when programmers meet with fashion designers, or crafters meet with makers. One of the main challenges that we are facing though, is the attempt to find ways of communication beyond diverse cultural backgrounds, disciplines and educational levels but also to overcome the fears of gatekeepers to lose control on their field. How would you approach these issues? Well, I really don’t think you can worry about gatekeepers who are frightened about being challenged. The way in which DIY culture challenges established publishers and companies and institutions is always, I think, exciting and refreshing. If their product is so great and unique then they shouldn’t have anything to worry about. If, on the other hand, they don’t really do much apart from the gatekeeping, well the internet has other ways of sorting and filtering things which are more open and participatory. There is a case to be made that the new culture which assumes that creative things like music should be free, or pretty much free once you’ve paid a small monthly fee, are damaging to artists and mean they are not properly rewarded for their creative work. I think that’s true, but the solution definitely isn’t to return to a model with bloated gatekeepers who keep most of the money. Instead we need better ways of spreading the riches around a bit more, and compensating the creative producers. That’s perfectly possible, if we just get a bit less complacent about letting a small number of big companies run away with all the value generated online. My main theme, though, is about the enabling power of the internet and the creative connections that people can make. Most of them aren’t people hoping to be making money from their creativity in any case – or if they are, it’s not because they think their digital things online will make them money directly, but rather that the inspiration and reputation that they get from what they do online will lead to reward in due course. So it’s here that the interdisciplinarity that you mentioned comes in. In colleges and universities, and in libraries and bookshops, knowledges and practices are divided into subjects and sections. In both education and in business, people often specialise in one particular thing. But online creative cultures tend to cross over all the traditional boundaries and divisions – you don’t even see the divisons, and there’s no requirement to file something in one place and not another place. So people come together in usual ways, or mix together ideas from different places, and make something new. That’s always really exciting.